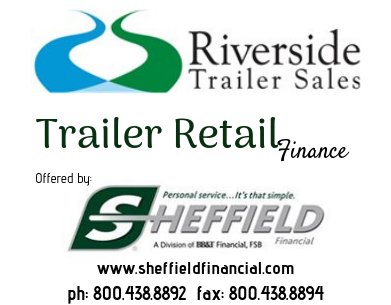 If you're considering financing your new trailer, you're in good hands with our finance department. We are happy to have the opportuninty to help you set up a fnancing plan that gets you the trailer you desire as soon as posible. Our friendly and professiional staff can help you get you on the road to your destination with your new trailer in no time. We just don't finance trailers, you can also add parts and accessories to your loan. For safety in towing your new trailer off our lot, your trailer requires the correct receiver ball mount and electrical hook up that speciffically meets proper set up. So there's no reason to put it off. Pease call or come in and talk to us today! We are proud to offer financing through Sheffield Financial. Over one million people have discovered why Sheffield Financial are the specialists in Financial Power! Click on Sheffield logo below and get on the road today!